Regardless of your security needs, business size, or number of locations, we have the right security solutions for you. Businesses today are looking to protect employees along with ensuring the facility is protected. Investing in Protection Systems Technologies permit you to monitor, control and guard your organization from unauthorized access, asset removal, or intruders. Control Panels — Innovative line of control panels that provide you with more of what you want; the power, capacity and versatility to satisfy virtually any installation requirements on a single platform. Control Keypads/ LCD Panels — A wide variety of flexible, easy-to-use keypads or LCD Panels that put security and convenience at your fingertips. Wireless Products — Wireless technologies are an exciting new advancement in security that provides the most reliable, convenient and cost effective solutions for ever-changing security protection needs. Sensors — Motion Sensors, Photoelectric Beams, Special Application Sensors, Glass Break Detector, Shock Detectors, Contacts, and Holdup Switches to name a few. Life Safety — Point identification and maintenance alert capabilities make it easy to identify the detector in alarm and simplify service and maintenance. Keyless Entry or Access Control Systems provide you with centralized administration capabilities along with remote site control over locations that contain a single controlled door to hundreds of doors, with 1000’s of users. Program your access privileges to specified areas, time of day, by defined groups or individuals quickly and easily using with intuitive, user-friendly software. Generate reports that can be created, customized and printed in minutes. Single-door architecture makes specifying, installing and maintaining the system fairly easy. Advanced features such as site graphics, IP camera integration and ‘Triggers and Actions’ further extend the capabilities of this cutting-edge system. Scalable; as your business grows or expands you need an access system that will easily grows with you need; you need a system that will integrate into other building systems or locations. 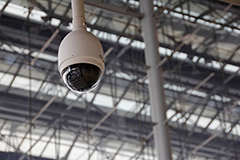 Video Surveillance Technologies, Camera Systems or CCTV Systems (closed circuit television), provide powerful cost-effective surveillance products. No matter if you require small, single-camera systems or large, scalable deployments with thousands of cameras. CRC can tailor the ideal Video Surveillance Solution for nearly any application by choosing from a variety of products available. Our goal is to provide surveillance solutions that permit you the ability to increase the protection you provide to your staff, assets, and property.